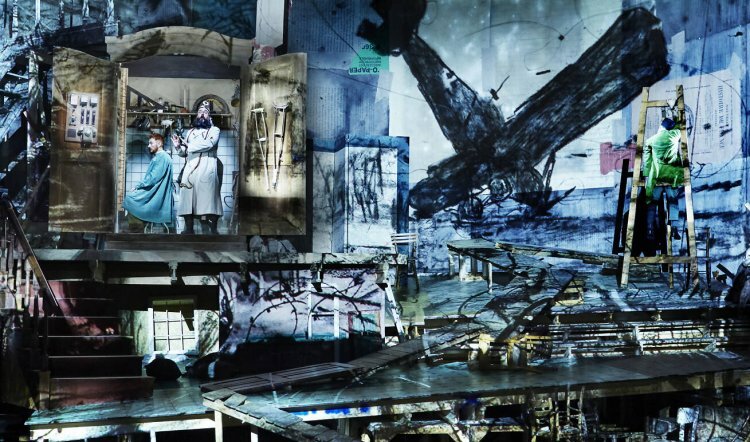 South Africa’s William Kentridge is a unique artist whose work defies easy description. Happily, an exhibition, that which we do not remember, is at the Art Gallery of NSW until 24 March and viewing it before seeing Wozzeck could be enlightening to anyone not familiar with his preoccupations. As it happens, Wozzeck, written in Germany the early 1920s and first staged in 1925, is grounded in the “violent absurdity” of Weimar and its composer Alban Berg drew “connections between art, ideology, history and memory” in using as his source, Georg Büchner’s Woyzeck, a play that was incomplete in 1837 when the writer died after a brief illness when he was only 23. Berg who also died suddenly – at 50 – was himself just 40 when he adapted the original play. 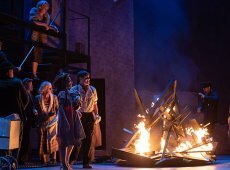 Interesting then, that the central core of the story is of a man – Woyceck/Wozzeck – who murders Marie, his lover and mother of his child, in a jealous rage. Appalling in its contemporaneity, domestic violence is joined by distrust in and dislike of the military and medical establishments as vivid secondary themes in the works. 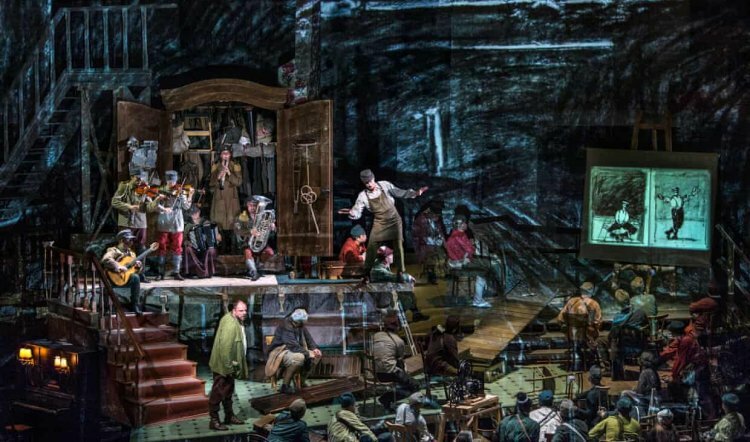 In framing the 100 minutes, no interval opera Kentridge appears to have drawn on historic imagery and politics in devising his distinctive charcoal drawn, animated film fragments. On a small screen, high up amid the single setting of chaotic broken buildings and cityscapes, flicker myriad images including a striking sequence of a mechanistic horse. The animal is reminiscent of a part-living, part-machine thing in George Grosz’s famous painting “Daum marries her pedantic automaton George in May 1920, John Heartfield is very glad of it.” In addition, the “pedantic automaton” is similar to how Marie’s child is portrayed – a puppet with a grotesque gas mask face. In another instance, parts of the backdrop are filled with various images of a male face, like the haunting 1835 pen-and-ink sketch of Büchner, by Alexis Muston. While being relentlessly drawn in to this world of visual havoc, it’s impossible not to think of the themes and preoccupations of Germany’s filmmakers of the 1920s: FW Murnau’s silent immortal Nosferatu, whose subtitle – A Symphony of Horror – could also describe the opera; and, even more vividly, the reverberations of Fritz Lang’s awesome Metropolis. Meanwhile, to this point, nothing has been said about the music, or the singers, or the orchestra. That’s because the optics of the production are overwhelming: a visual tsunami that (almost) engulfs voices and orchestra. It seems Kentridge has absorbed Berg’s preoccupations: the Germany of hyperinflation, despair, death, corruption, poverty and loss – of meaning, horizons and hope. He’s then spat them out onto film and paper: Nazism rising and community destruction everywhere. 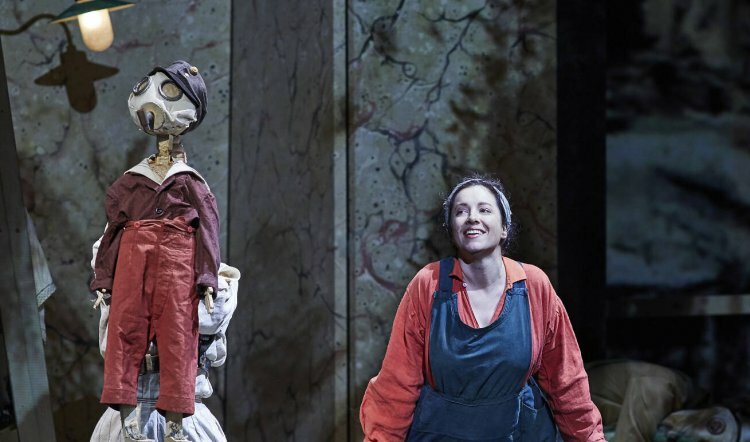 Meanwhile, for the hapless Wozzeck, aside from murderous, impotent jealousy, the themes of his journey are the inevitability of inequality and criminality and his escalating descent into mental turmoil and disconnection. And that’s where Berg’s score and Michael Honeyman as Wozzeck really shine. Honeyman is highly effective in the role of the bewildered man. He effortlessly spans the range and vocal demands to bring to life an all too likely human being. Lorina Gore is exceptional in overcoming the Male Gaze aspect of Marie’s character: a heedless temptress who “deserved it”. Instead, she fashions a 3D person of the young woman. Her vocal dexterity and acting ability bring heart to her interactions with her puppet child, while her vivacity and sensuality are in vibrant, credible contrast to her surrounds. The always characterful Dominica Matthews also does a great job with the role of Margret. She’s a dodgy piece of work whose understanding of her place in the scheme of things doesn’t mean she accepts it. Credibility beyond the call of duty is also in abundance in John Longmuir’s portrayal of the Captain, a comically overwrought fellow whose bouffant plumes are too like those of a strutting, screeching cockerel to inspire regimental trust. In contrast, Richard Anderson’s Doctor is a deceptively benign fellow whose cumbersome apparatus and experiments on Wozzeck are way more sinister than his rotund geniality suggest. The societal psychosis at the heart of the (oddly undramatic) drama is literally played out in the music. Conductor Andrea Mollino and the Opera Australia Orchestra (and ill-used Chorus) obviously relish the opportunity to get stuck into music that’s so at odds with their core repertoire. The fragmented, ambiguous, atonal yet emotionally expressive score is delicately teased out by conductor and ensemble; their discipline, clarity and musical nous making a welcome case from the pit against the visual bedlam happening above and behind them. Their playing also heightens the late, startling switch to an almost lush, romantic sequence that brings the work to an end. 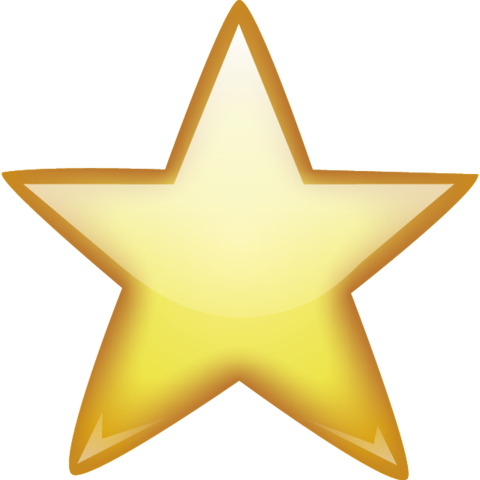 If you get the visual dizzies, closing your eyes and listening to the voices and musicians is rewarding.